Uniting people from private companies, government, and the general public, to work together in an effort to eliminate liver fluke and reducing CCA. 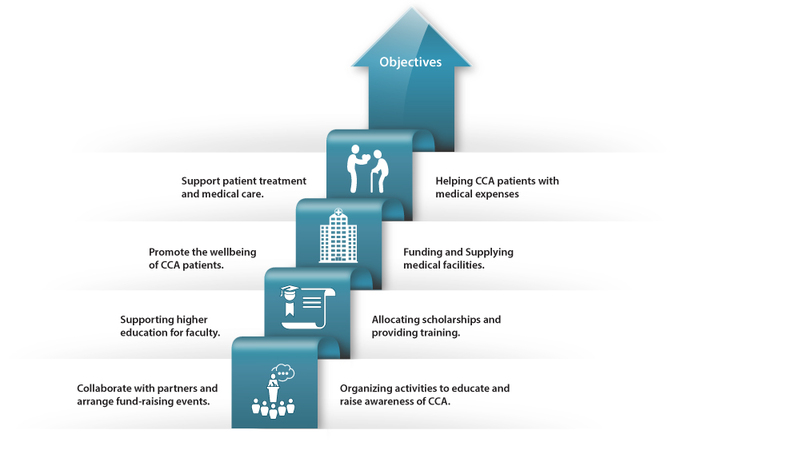 Expanding opportunities for patients by providing financial assistance for the medical costs associated with CCA. To promote the wellbeing of patients, and to support a better quality of live for palliative care patients at the end of life. Supporting faculty members by allocating scholarships and providing training for the care and management of CCA patients. Organizing activities that raise awareness to the risk factors associated with CCA and facilitate education for the prevention of the disease. Collaborating with other charitable organizations to advance the global efforts in the fight against CCA.